Presented by Lowe’s Canada, taking place at Palais des congrès de Montréal from September 12 to 14. Bringing together over 330 suppliers and 300 affiliate dealers and their respective teams for three days of presentations, meetings, and business opportunities. 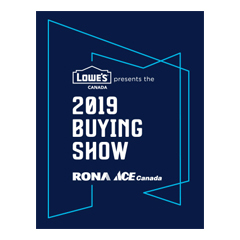 With over 2,000 participants, the Buying Show provided Lowe’s Canada suppliers—many of whom from Quebec and all over Canada—with a unique opportunity to present their new products, services, and exclusive offers to RONA and Ace Canada dealers across the country. Visit the Lowe’s website here. This entry was posted in 2018 Shows, Show Resources, Trade Shows and tagged 2018, back wall, Buildings Show, Canada, Conference, Design, Displays, event, Exhibits, expo, fabric displays, Home Hardware, Marketing, montreal, Show Services, toronto, Toronto Trade Shows, trade show, Trade Shows. Bookmark the permalink.